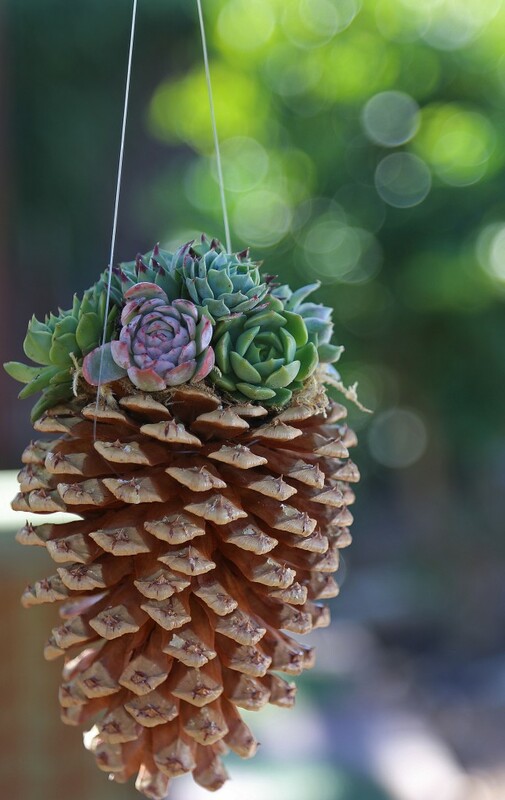 If you’re looking for a cool craft that is a quick and easy D.I.Y project, try this hanging pine cone succulent planter. I love innovative craft ideas and this pine cone planter is not only affordable, but also a gorgeous way to show off succulents. These would be great hanging from a large tree, under a porch, or even indoors in a sunny window. They require very little care and will last for a long time. It makes a unique gift too!. My friend Lynn went to the local mountains over Thanksgiving and came back with a sack full of these big, beautiful pine cones. She had intended to use them in her Christmas decorations, but decided against it and handed them over to me. It looked like a sack of gold!!! I had the itch to do some decorating with pine cones and filled several baskets on my front porch with the cones and fresh greens. Adorable! Then one day Lynn and I went to Rodgers Gardens to enjoy their Christmas display and what did my wondering eyes behold? A beautiful pine cone topped with succulents. (Insert the sound of angels singing) Presto! I had my inspiration. After reading my friend Mary’s blog (It’s All About The Pretty) about growing succulents on top of pumpkins, I knew all I needed to make this very cool craft! A sturdy cup to hold the pine cone upright or the cap from the spray adhesive (this is just used as a holder). This diy project is so easy, you’ll want to make several! 1. Start with a pine cone that has a bit of a bowl shape to the top of it. This helps hold the moss. Spray the top of the pine cone with the adhesive and press in a wad of sphagnum moss. You’re not trying to press the moss flat, rather you want a bit of a mound. The tangle of the moss is what will secure the succulents. 2. About 1/4 of the way down the pine cone wrap one end of the fishing line or twine around the cone 2 times and pull so it’s wrapped snugly around the core of the cone. Leave enough extra so you can pull the extra up the opposite side and tie it about 6-8″ above the top of the cone. Make sure your knot is secure. Leave the extra line for hanging the finished planter. You want the two lines to be opposite one another when you pull them up so the cone hangs evenly when suspended. Check your work by holding up the pine cone. If the top hangs fairly level you’re set. If not, work the line between the pine cone parts until you get it hanging fairly level. 3. Set it in a cup or in the lid of the spray adhesive so you can use both of your hands. 4. Remove any soil from the roots of the plants, or break off “pups” growing around mature plants being sure to leave 1/2 to 1 inch of stem. 5. Push the succulents into the moss stem first and arrange however it pleases you most! It’s best to keep your plants within the diameter of the cone so they have support from the cone until their roots develop. This was really a cool craft!! I generally like to arrange the succulents so that they appear to be growing from the center of the top of the cone. Feel free to use just one type of succulent or mix and match colors and textures. No succulent works better for this project than Hens And Chicks. Hen’s and Chicks typically refers to Echiveria (a bit larger than Sempervirum when mature and less tolerant of very cold weather) and Sempervirum (smaller than Echiveria and very tolerant of cold weather). Each of these succulent varieties grows a main plant (the Hen) in a rosette pattern and sends out new plants (Chicks) on stems around the main plant. If you are buying succulents look for a plant with “Chicks” attached to stretch your dollar. The Chicks can be removed from the “Hen” and will grow their own roots. If you grow your own Hens And Chicks, you can simply remove and use some of the Chicks. I did both in the examples pictured. Either way, remember to leave enough stem to push into the moss. Other types of succulents work well as filler, like anything small that hangs. String Of Pearls should work fine, but I’d avoid anything like Donkey Tail given its heavy weight will likely pull out of the moss before it can root. A few sprays from a mister once a week is all it needs! If you are hanging your pine cone succulent planter indoors, keep it near a bright window. It can take direct light, and you will want to rotate it once a week for more even exposure. If it gets really hot, it will need more frequent watering. If you’re hanging it outside, aim for a spot with bright light and, if it gets a lot of direct sun, be sure to water it more frequently. By the way, if you’re using fishing line, be aware that it breaks down quickly with a lot of direct sun exposure, according to The Mister. Thanks for the tip, Sweetie! Please send me photos of your pine cone planters. I’d love to see them! Oh my gosh, I LOVE THIS, how cool. In my backyard I have a plastic garbage container full of pinecones. You can probably add a tiny faux flower arrangement as well, which would be perfect for Easter. Thank you for sharing this. When I find some time i will try to make one of these planters. I will try to figure out a way to send some photos to you when I get them done. Been having some on and off computer problems lately. This is so beautiful! Reminds me of pine comes we used to find in Crimea – what a trip down memory line! Ahhh…so sweet are memories!!! Hope your day is beautiful! I am enjoying myself working on a major project (through minor frustrations). How are you feeling, darling? A couple of big grants, helping kids with special needs. And….that is what makes you such a loving, caring, compassionate lady!!! Neh… it’s my grandmother, with help from Above! You have such a beautiful soul! It takes one to see one – we are mirrors of each other! We truly are!!! Can’t wait till this last surgery and heal and come see ya! Me too! My BFF Sandy is too! I can’t wait!! Oh great! The more, the merrier! And the doggies? Yes, pet friendly, of course. I’m like you with your kitties! But kitties don’t travel. They are homebodies. Yes, but if they could, you would. How cute is that!!!! =) Great way to use natural resources. I thought it was adorable also Tam, just had to reblog!!! I thought so too! I’m so glad people are enjoying it! She is very clever! Thank you so much….that is sooooo pretty!!! It looks like out of a fairy tale, i love it! This is the first coolest!